Roads – Go to MapQuest and enter a city to get a custom map of Mexico. Earthquake Activity – Click on the blue arrows to see other portions of Mexico. Languages – Choose one of four detailed maps. Flags – Click on the map of Mexico to see each state’s flag. eBook Maps – Free eBook maps for eBook devices. 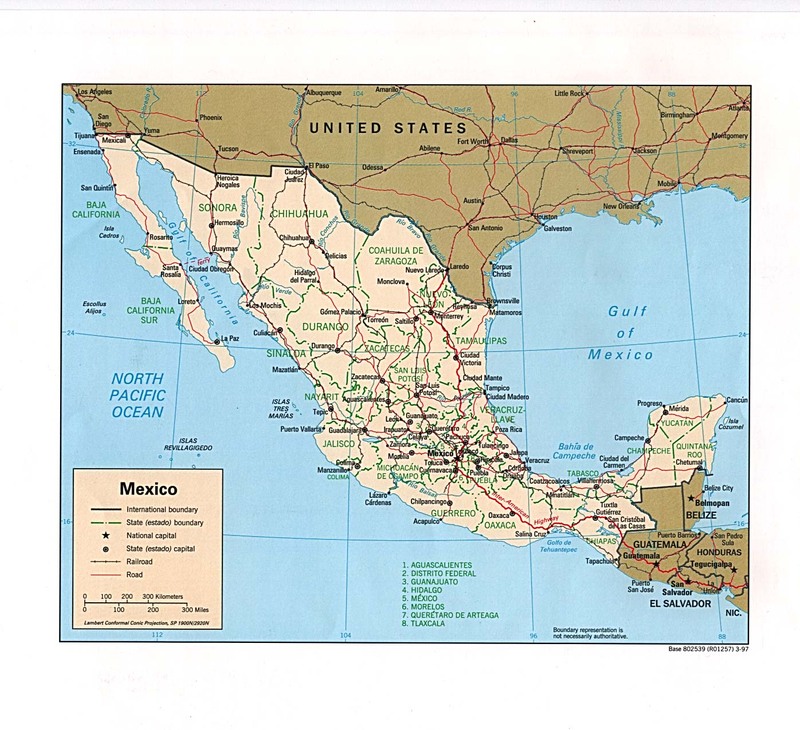 Mexico Road Atlas – ‘Gran Atlas de Carreteras,’ or The Grand Mexico Road Atlas, is a great product for travel or reference in Mexico. Produced by the country’s leading mapmakers, Guia Roji, this soft-cover saddle stitched atlas covers all the states of Mexico on two-page spread pull additional pages highlighting populated areas. 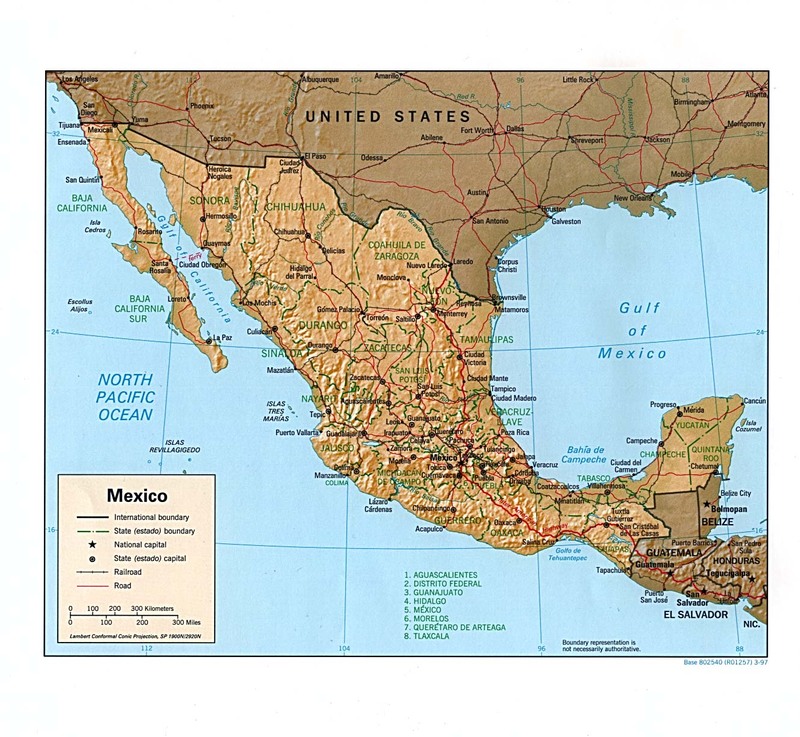 Mexico Detailed Wall Map – This map contains extensive political information, focusing on countries, capitols, and other cities. Political boundaries are presented very clearly, with different color-bands for each country. Deluxe Wall Map – Entirely in Spanish! Introducing the Maps.com Mexico Deluxe Wall Map. This map is not only useful, but aesthetically pleasing as well. The bold colors used to delineate the Mexican states allow for the subtle shaded relief to be clearly visible. Small portions of the USA and Central America are present for an atlas style map. The Legend explains the attributes present on the map. An inset is included to show the physical terrain of the country. 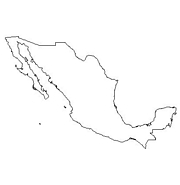 Click here for all Mexico map products – Maps.com! Mexico is about three times the size of Texas at 753,665 square miles and has a 5784-mile coastline. The land is comprised of high, rugged mountains, low coastal plains, high plateaus, and a significant amount of desert. The climate varies from tropical to desert. The highest point is Volcan Pico de Orizaba at 18,702 feet. The population is 104,959,594 (July 2004 estimate). Its ethnic groups are mestizo (Amerindian-Spanish) 60%, Amerindian or predominantly Amerindian 30%, and white 9%. Roman Catholics make up 89% of the people and Protestant 6%. They speak Spanish, various Mayan, Nahuatl, and other regional indigenous languages. Officially known as United Mexican States, the administrative divisions are 31 states. The government type is a federal republic. The country gained independence from Spain on the 16th of September, 1810. Vicente Fox of the National Action Party (PAN) was sworn in on December 1st, 2000, as the first chief executive elected in free and fair elections. Mexico has a free market economy with a mixture of modern and outmoded industry and agriculture, increasingly dominated by the private sector. Recent administrations have expanded competition in seaports, railroads, telecommunications, electricity generation, natural gas distribution, and airports. Per capita income is one-fourth that of the US. Principal industries are food and beverages, tobacco, chemicals, iron and steel, petroleum, mining, textiles, clothing, motor vehicles, consumer durables, and tourism.